Here is my conversion in progress. It's a Loadstar 1600 with a 345ci IH V8 (5.6 Liter). I love the use of woods in the interior. I'm beginning work on a 75 IHC/Carpenter and that's my plan; lots of wood! Last night I added two new batteries adding another 270 AmpHrs to my bank. Now I am at a total of 915 AmpHrs of battery capacity. How are you charging your battery bank?...what are you running off it? Inside my bus I run two refers, microwave, two elec heaters, satelite tv, stereo, and the water faucet pumps. How long do you think you can run those items now without a battery recharge? Why didn't you use the UPS' you talked about in the other post? I drove the bus down to NAPA today and picked up some winter blades. They were kinda expensive but they will be much better than the regular assembly that have been on there forever. I recently installed a new CD player under the dash. 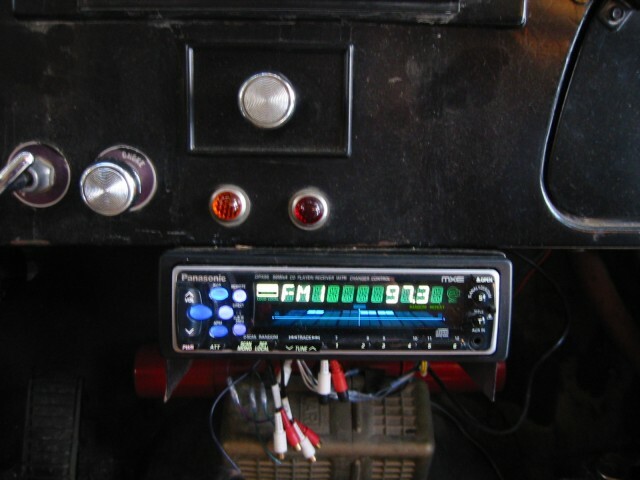 I couldn't get the old radio out without completely taking all of the plastic below the windsheild off so I build this u-braket out of sheetmetal and mounted the stereo under the dash. Someone decided to take on of my interior lamps and smash it on the floor last night. Luckily Lowes carries all kinds of globes, I found one I can kinda get to work as a replacement.